*** This clinic does not accept self-pay patients. *** Dr. Corey Tabit is a board-certified cardiologist at the University of Chicago Medicine. Dr. Tabit believes in open communication with his patients, allowing him to guide them through their treatment as an active participant in their well-being. He encourages personal responsibility in healthcare, which includes attention to health maintenance as well as interactive decision making during times of illness. 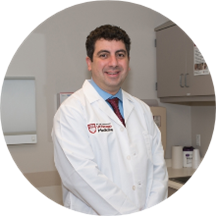 Dr. Tabit earned his medical degree from Thomas Jefferson University and completed his internal medicine residency and vascular medicine fellowship at Boston University Medical Center. He completed fellowship training in cardiovascular medicine at the University of Chicago Medicine. In order to best serve you, please remember to provide your unique member ID number on your insurance card for your appointment. If this is not provided, you may expect a call from our office to get that information prior to your appointment so we can verify your benefits. We look forward to seeing you. Tabit CE, Coplan MJ, Chen P, Jeevanandam V, Uriel N, Liao JK. Tumor necrosis factor-a levels and non-surgical bleeding in continuous-flow left ventricular assist devices. J Heart Lung Transplant. 2017 Jun 08. PMID: 28651907. Tabit CE, Coplan MJ, Spencer KT, Alcain CF, Spiegel T, Vohra AS, Adelman D, Liao JK, Sanghani RM. Cardiology Consultation in the Emergency Department Reduces Re-hospitalizations for Low-Socioeconomic Patients with Acute Decompensated Heart Failure. Am J Med. 2017 Apr 27. PMID: 28457798. Tabit CE, Chen P, Kim GH, Fedson SE, Sayer G, Coplan MJ, Jeevanandam V, Uriel N, Liao JK. Elevated Angiopoietin-2 Level in Patients With Continuous-Flow Left Ventricular Assist Devices Leads to Altered Angiogenesis and Is Associated With Higher Nonsurgical Bleeding. Circulation. 2016 Jul 12; 134(2):141-52. PMID: 27354285. Tampakakis E, Tabit CE, Holbrook M, Linder EA, Berk BD, Frame AA, Bretón-Romero R, Fetterman JL, Gokce N, Vita JA, Hamburg NM. Intravenous Lipid Infusion Induces Endoplasmic Reticulum Stress in Endothelial Cells and Blood Mononuclear Cells of Healthy Adults. J Am Heart Assoc. 2016 Jan 11; 5(1). PMID: 26755554. Tabit CE, Onsager DR, Kim GH, Jeevanandam V, Fedson SE. Positional obstruction of the superior mesenteric artery by an intra-aortic balloon pump placed through subclavian artery approach. Circ Heart Fail. 2014 Sep; 7(5):864-7. PMID: 25228321.